Photograph of the Bolan Pass from the Macnabb Collection (Col James Henry Erskine Reid): Album of Miscellaneous views, taken in the 1880s. The Bolan Pass is a gap in the central Brahui Mountain Range, Pakistan. The pass is approximately 60 miles long (100 km) and is at an altitude of 5,880 feet (1,792 metres). Due to its strategic location, the pass has traditionally been used as a gateway to India by traders, invaders and nomadic tribes. 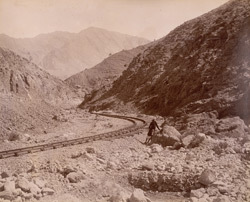 The railroad cuts through the pass en route to the Afghanistan frontier.